Setting up categories, category rules, and aligning them with your accounting system. 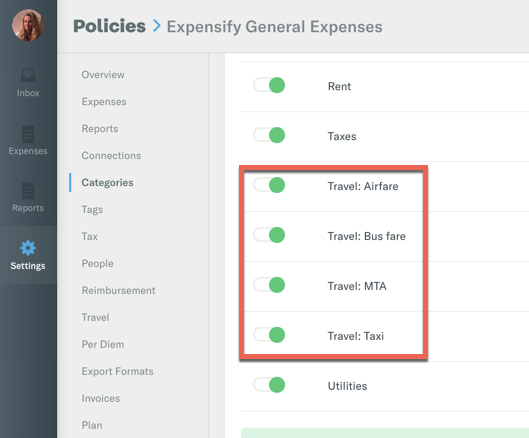 If you are using Expensify for individual use, you will want to set up categories in your personal policy's settings. These categories will be overridden if you are reporting on a company policy. Go to Settings > Policies > Individual > [Policy name] > Categories to find your categories setup page. Are you an admin for a group policy? Read on! In Expensify, Categories is a term that refers to the Chart of Accounts, GL Accounts, Expense Accounts or Expense Categories (depending on your accounting system). They are line-item expense details that correspond to your accounting and financial reporting systems. If you are using one of our web service integrations with QuickBooks Online, QuickBooks Desktop, Intacct, Xero or NetSuite, then we will automatically pull in these categories from your accounting system. If you are not using one of these systems, then you can import your categories either by CSV file upload or individually. Each category can also be set up to have specific rules like required receipts, maximum expense amounts, and description being required. This can also now be done on the mobile app. Check to make sure that the default policy is set to the policy you'd like to make category changes to. If not, tap and re-select the correct policy. Tap Categories. 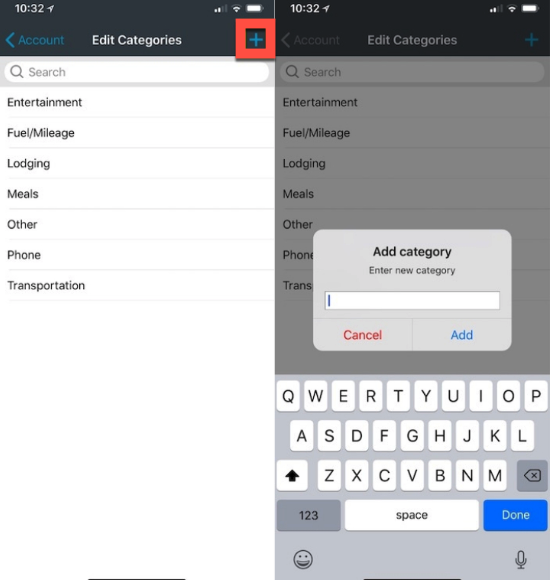 On the next screen, you can add categories using the + button, swipe left to delete a category, or tap a category name to edit it. 1. Create the spreadsheet of these accounts and save this as a CSV file. One column (column A) should be the user-facing account name (the "category" the user will select on their edit screen. A second column (column B) can have the GL number associated with the account. If you would like to create sub-categories under your category selection drop-down list, you can do so by adding a colon after the name of the desired category and then type the sub-category (without spaces around the punctuation). Control policy admins have the ability to enable specific rules based on the category of the expense. 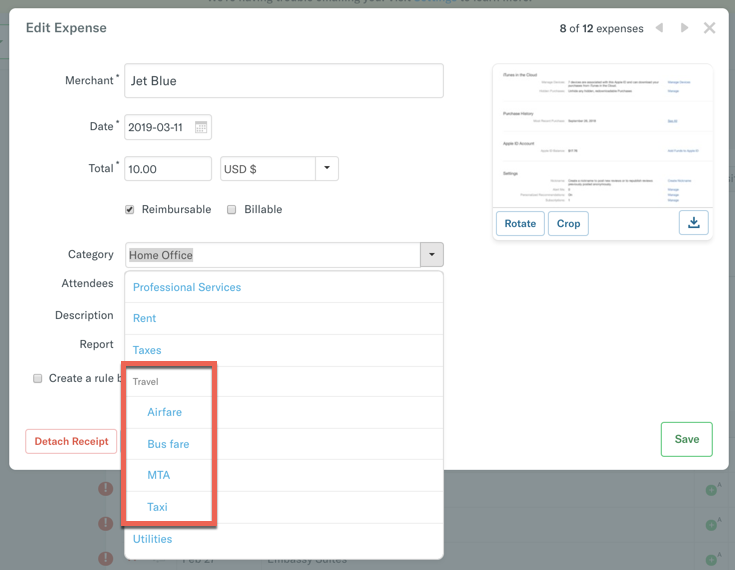 This feature allows admins to have control of expense reporting on a more granular level. The following are the rules that can be set specifically at the category level. Click the settings cog next to the category name that you would like to define rules for. Max Amount: Allows you to set specific expense amount caps based on the expense category. You can do this per individual expense, or per day (for expenses in a category on an expense report). Receipts: Allows you to decide whether you want to require receipts based on the category of the expense. For instance, it’s common for companies to disable the receipt requirement for mileage expenses. Description: Allows you to decide whether to require the description field to be filled out based on the category of the expense. Description Hint: Allows you to place a hint in the description field. This will appear in light gray font on the expense edit screen in this field to prompt the expense creator to fill in the field accordingly. Want to quickly update category rules in-bulk? You can do so by exporting to CSV, editing the spreadsheet, then importing back into the categories page. This will allow you to quickly add new categories, and set GL codes, payroll codes, description hints etc. If users are in violation of these rules, those violations will be shown in red on the report. Any category-specific violations will only be shown once a category has been selected for a given expense. Expenses with violations will not be auto-submitted if Scheduled Submit is enabled for a policy. Description hints will be displayed both in the expenses table (shown above) and in the expense editor (shown below) once a category is selected. If you're importing card transactions, Default Categorization will provide a massive benefit to your company's workflow by automatically coding expenses to the proper GL. Once configured according to your GL, the default category will detect the type of merchant for an expense based on its Merchant Category Code (MCC) and associates that expense with the proper GL account. This time saver keeps employees from having to manually code expenses and provides admins with the peace of mind that the expenses coming in for approval are more reliably associated with the correct GL account. Best of all, this works for personal and company cards alike! Under the Category column, select the account that most closely associates with the merchant group for all groups that apply to expenses that you and your coworkers submit. If you are unsure, just leave the group Uncategorized and the expense will not come in pre-categorized. You're well on your way to expense automation freedom! 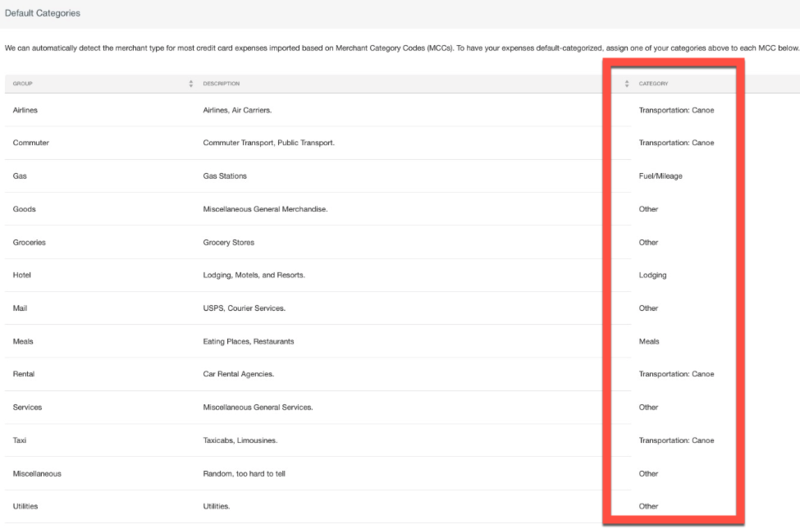 Over time, Expensify will learn how you categorize certain merchants and then automatically apply that category to the same merchant in the future. You can always change the category; we'll try to remember that correction for next time! Any Expense Rules you have set up will always take precedence over implicit categories. 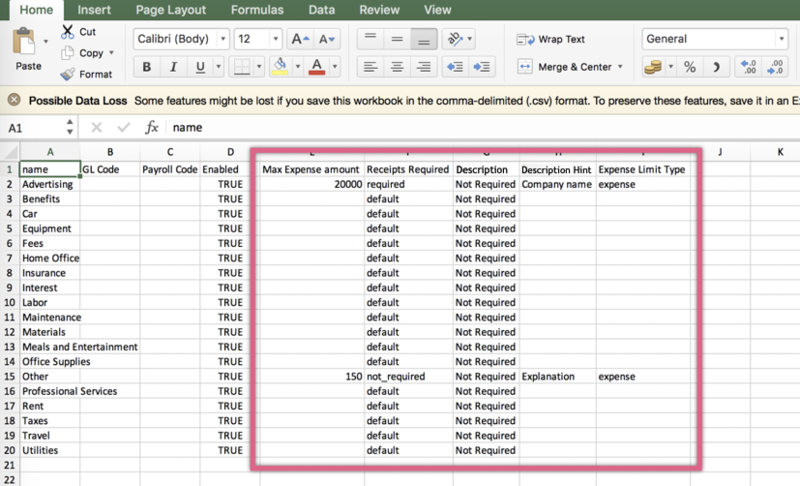 Implicit categorization will only apply to expenses you have not explicitly set a category for already. Changing the category on one expense does not change it for any other expense that has an explicit category already assigned. This built-in feature will only use the categories from the currently active policy on your account. You can change the active policy by clicking your account icon in the app and selecting the correct policy name before you SmartScan.